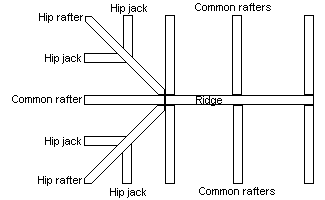 The Common Rafter tool calculates everything needed to lay out a common rafter based on known inputs. Common Rafter tool inputs include total rise, total run, horizontal eave distance, HAP, and ridge beam thickness. The figure below shows a common rafter in the context of a regular hip roof.